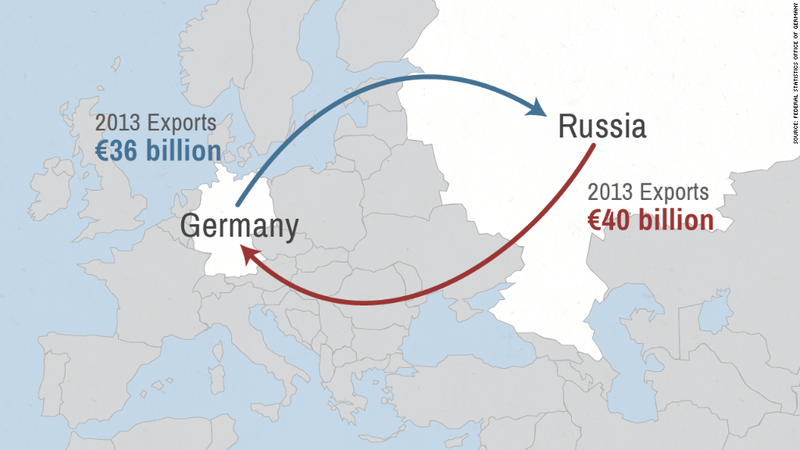 Concerns are growing about how the crisis in Ukraine could impact the trading relationship between Germany and Russia. The outlook for Germany's economy is looking dimmer as tension in Ukraine continues. German economists and analysts are growing more cautious about the country's near-term prospects, according to a widely respected survey from the Centre for European Economic Research. This is the second consecutive month the survey has mentioned Ukraine as a key risk factor for Germany -- though the report also showed experts were the most optimistic they've been about the current economic situation since July 2011. The high level of optimism may be another reason behind the cautious outlook for the future, the report noted. Germany's trade relationship with Russia -- worth over €76 billion ($105 billion) last year -- could suffer if western nations impose further sanctions on Russia for its actions in Ukraine. Ukraine and western countries maintain that Russia is trying to destabilize parts of eastern Ukraine, though Russian officials have denied these accusations. Last month, Russia took control of Ukraine's Crimea region. Germany is Russia's largest trading partner in Europe and more than 6,000 German companies do business with Russia. Germany also relies on Russia for nearly half of its natural gas, and concerns are rising that Russia may taper its gas supplies to Europe. German stocks have taken a hit, with the benchmark DAX index declining by about 3% since the start of the year, compared with slim gains for the broader European market.